Any chance you might re-run the tests using jmeters or funkload? I love ab for quick and dirty benchmarking, but find that the results are pretty artificial when compared to a more realistic load. 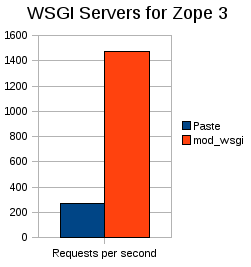 That said, the little bit I know about mod_wsgi, and it’s interaction with Zope3 makes me more interested than ever to learn more. Bookmarking this story for sure. When I start testing a real application, I’ll definitely use a real load testing tool. where do you get or create the /opt/myapp/deploy.ini? could you post it or email it to me? i have tested that WSGI is configured correctly by making a simple ‘hello world’ program. Nate, deploy.ini is a Paste Deploy configuration file. It is highly specific to whatever you are creating. Please refer to the Paste Deploy docs.